Rebecca Myatt reviews a book that offers an excellent overview of respiratory conditions. This text presents information on respiratory conditions in a succinct manner, beginning with an overview of the historical context of respiratory nursing and moving on to discuss anatomy and physiology, epidemiology, exercise, nutrition and pulmonary rehabilitation. There are two particularly good chapters that summarise history-taking and physical assessment – skills nurses are increasingly expected to have. Respiratory disease is then covered in an easy-to-read, concise format, with numerous visual prompts to aid the reader. Respiratory medication and prescribing are discussed, followed by acute and supportive/palliative care. Each topic is presented over two pages, with one page of text and one containing charts, tables, diagrams, photographs and pictures, making it a visual read. 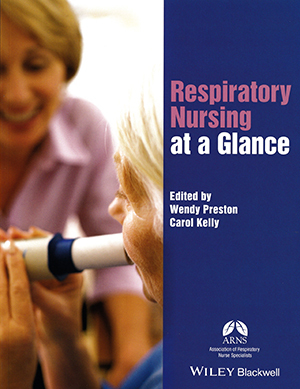 The book is written in collaboration with the Association of Respiratory Nurse Specialists, and as such the style is informative but accessible. At the end of each short chapter is a link to further current information, such as guidelines from the National Institute for Health and Care Excellence, British Thoracic Society or Global Initiative for Chronic Obstructive Lung Disease. The book has a strong nursing focus and provides an excellent overview of the topic. It would be suitable for newly-qualified staff and those with more experience, such as clinical nurse specialists and ward managers.